Update (9/22): So my source was kind of right as the offer did change today but I’m not sure it is a better offer. 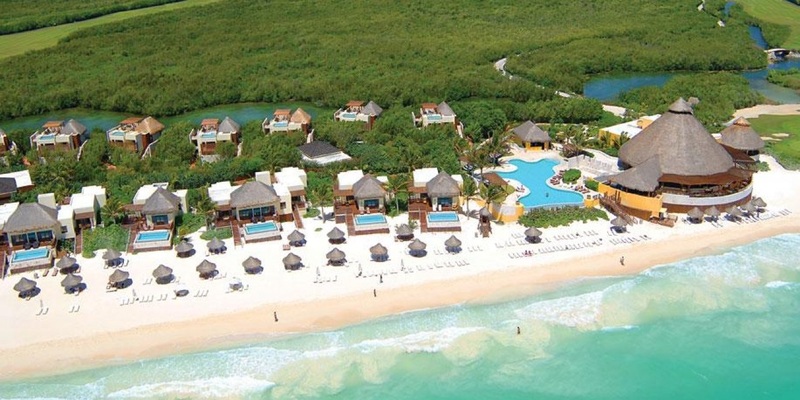 Here is my analysis of the new offer of two free nights at category 1-5 hotels. 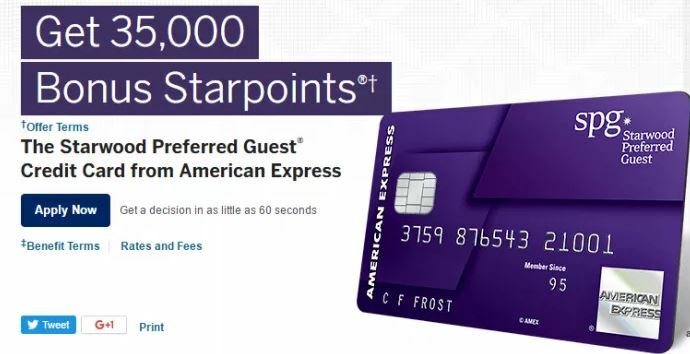 I want to stress the following information is simply a rumor but I believe the signup on the American Express Starwood personal and business cards will increase to either 30k or 35k Starpoints in the next two weeks. I have a friend of a friend who is “connected” at American Express and he claims that the go live date for this offer is the week of September 19th. He didn’t know whether the offer would be for 30k or 35k like it was in March. Could this information be accurate? 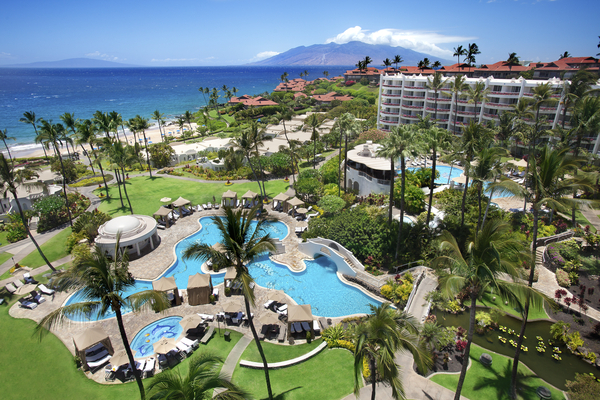 Well in years past usually around summertime, though there was a curveball with the 35k offer in March this year, American Express has typically increased the signup bonus on the SPG cards. I went back and put a list together of when over the past few years the publicly available bonus has increased to 30k or 35k Starpoints. Anyone spot a trend? Starpoints are incredibly difficult to earn – the only feasible way to earn them is via the Starwood credit card and staying at SPG hotels. Since it is difficult to earn these points in bulk, an extra 5k Starpoints is a big difference to me. And to the average person who doesn’t manufacture spend that equates to spending an extra $5,000 on your SPG Amex to make up that extra 5k points. American Express limits you to one bonus per lifetime on their cards. Basically you only get one shot to signup for this card to earn a bonus so you better make it count. I won’t signup for an American Express card unless I know at that point in time, that is the highest ever known offer on a card. Starpoints are one of the most valuable, if not most valuable, points out there. 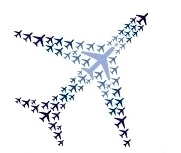 Great flexibility with dozens of airline transfer partners, a transfer bonus of 5k when transferring in 20k increments and some great hotel redemptions in the Starwood chain. 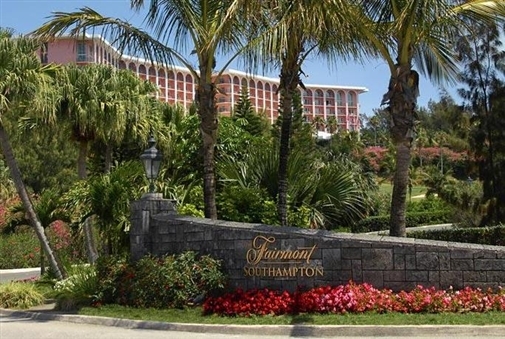 You can redeem points for weekend nights at lower tier SPG hotels for 2k or 3k points a night. My advice is to resist the temptation to signup for the next two weeks just in case the offer is increased unless you have an absolute urgent need for this card. 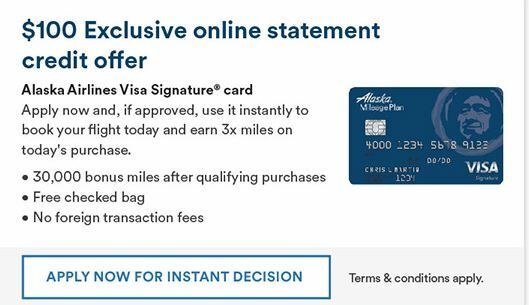 While American Express might very well match you to the new bonus anyway, remember that American Express limits you to one bonus a lifetime, so you always want to get each Amex card at its peak signup bonus offer. Again I do want to stress this is only a rumor (some will argue I shouldn’t even post unconfirmed information like this) but based on past history, there could be some merit to this information. I’ll be sure to post an update in two weeks if/when the offer is increased. If my information is correct & you plan to apply for this card at that time, I hope you will consider using my referral links for either the personal or business card (for being a current cardmember, not an affiliate link) for possibly earning you an extra 5k to 10k Starpoints by advising you to wait. I just completed a mini app-o-rama and I wanted to share the final results as I was not approved automatically for any of these 3 cards but #spoileralert, I ended up getting all 3 cards in the end. I post about my credit card dealings as these posts are always popular with readers but please remember just because I apply for a card (or 3) doesn’t mean you should. In fact, you probably shouldn’t as I know what I am doing and the risks associated with it. We are at different places in the miles/points games and probably have different travel goals/needs. With that disclaimer out of the way, here is what I applied for and why. Don’t settle for the standard 30k offer! This was the first card I applied for in this series of applications since I’ve been able to generate a 50k offer repeatedly but unsurprisingly I was not approved instantly (I never am with Chase anymore). I am running low on United miles and with it being 2+ years since I last got the signup bonus on this card, I wanted to see if Chase would give me my second United Explorer card without an issue. Nowadays I’ve been advising against calling Chase for reconsideration but I wanted to get this card sooner rather than later as I need to book a United award and would most likely need the extra award availability benefit to find the award space I was looking for. I got grilled during my approximately 15 minute reconsideration call but the agent at the end offered to take a 10k credit line from my IHG card and move it my United card. This effectively forced me to close my IHG card which was fine with me. With the annual fee waived for the first year, this was a great offer for me and fit my upcoming travel plans perfectly (I even have a use for the United club passes I get with the card). Don’t settle for the standard 10k offer! I’ve actually had my eye on this card for a while now for two main reasons. The biggest reason is I need a card to keep my Membership Rewards points active and still transferable to airlines/hotels as I plan on closing my Business Gold card when the annual fee is due in March. The other reason I wanted this card is for Amex Offers – as this is a no annual fee card, I know year in and year out I will make money off this card with Amex Offers. I will add a few authorized users to take even more advantage of the Amex Offers. I was not approved instantly but I received an email a few days later congratulating me on my new card without having to call reconsideration. The normal public offer is only 10,000 points but I was able to generate this better offer of 25,000 points by using the infamous incognito method on this link here. It took several times across several browsers to get this offer to show but finally I tried this link in private mode on Internet Explorer and got the 25k offer. I plan on posting more about this separately but basically you should try opening a link for an Amex card in a private browser and/or mobile device as American Express is unlikely to recognize you as a current customer and thus will occasionally present a better offer. This method is reportedly working to generate a 75k offer on the Business Gold and Business Platinum cards. This card is a bit of an outlier for me (and from a bank I never heard of until recently) as I normally don’t focus on cashback cards but I have three very specific reasons for getting this card. The first reason is for the 5x earning ability on all purchases during NBA All Star weekend and the two weeks of the NBA finals – this will help greatly with my increased on manufactured spending/reselling margins during that time period. Another reason I wanted this card is that this is one of the few cards you can load to Serve online and earn points for it. However, from the time I applied to the time I actually got the card, Amex cancelled thousands of Serve accounts though not mine (for now). I plan to load it monthly to earn 1,000 points (more during the 5x periods above) for $10 until I’m shut down. Lastly, I wanted this card as this is yet another no annual fee American Express like the Everyday card above and thus eligible for Amex Offers, even though it is issued by BBVA Compass. I was not approved instantly for this card but I later received an email about a week later congratulating me on my new card without having to call reconsideration (that is if BBVA has reconsideration?). This seems like a misfit of cards but I’m actually quite happy with this round of applications. If you noticed, I only applied for cards that had higher than normal signups as I always want to maximize my points/miles – if you are going to get hit with a credit inquiry, might as well make it worthwhile. In summary, I acquired two no-annual fee cards that I plan on keeping so this will help with the average of my accounts. They are both eligible for Amex Offers so I will continue to make money off them as I’ve racked up hundreds of dollars of savings on my other Amex cards with Amex offers. 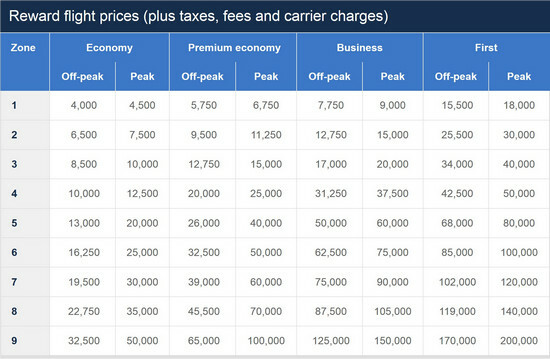 The United card is good for a quick infusion of 50k miles and I can see myself taking advantage of the extra award availability for United credit card holders. Lastly, in case you’re wondering these 3 credit cards were my 41st, 42nd and 43rd credit card I’ve had in my own name. And my actual FICO credit score right before I did this series of applications? An outstanding 805 which goes to show if you are know what you are doing, this hobby won’t just fund your travels – it can give you a near perfect credit score.